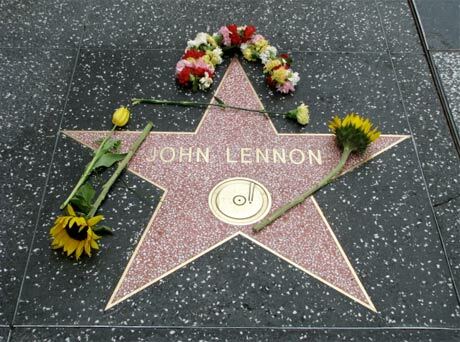 California Beatles fans hoping to pay tribute to John Lennon have been disappointed to discover that his star on Hollywood's Walk of Fame has disappeared. The brass star, which has been in the sidewalk on Vine Street since 1988, is now gone, replaced by a "trashbag, and beneath that is an empty outline of a star," reports the LAist. It's currently unknown where the star has gone, since the person in charge of the Walk of Fame is on vacation until January 4. The Guardian speculates that "cleaners may be polishing it," but that seems unlikely, since it wouldn't necessitate the star's removal. A more likely reason is that the star is being moved in preparation for the 50th anniversary of the Walk of Fame on February 8. Ringo Starr is being honoured with his own star that day, so it's possible that their stars will be placed together. Of course, others are speculating that the star may have been stolen. If that's the case, some lucky thief has made off with the ultimate piece of fan memorabilia.